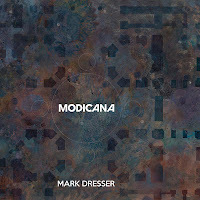 Modicana is the new album from the legendary bassist Mark Dresser. If you’re a fan of free jazz, or a regular reader of this blog, you’ve probably encountered his playing. Dresser was one of the members of Anthony Braxton’s legendary quartet from 1985-1994 and has played with an impressively long list of master musicians including Nicole Mitchell, Myra Melford, Marilyn Crispell, and hundred (thousands?) of others. And thankfully, Dresser took over teaching duties when the master Bertram Turetzky retired and is now influencing another generation of players at the University of California San Diego. 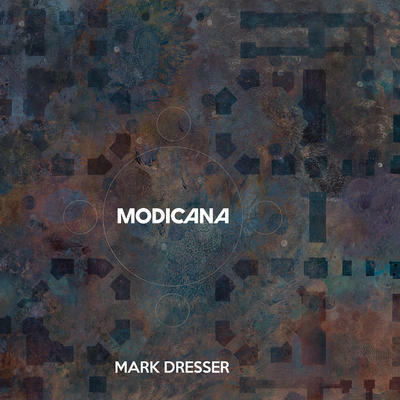 Modicana is a record of solo bass, following in the tradition of Dresser’s earlier solo work like Guts: Bass Explorations, Investigations, and Explanations (2010) and Invocation (1994). Two of the tracks on Modicana were recorded live at the Umea Jazz Festival in October 2016 (“Inocation Umea” and “Threaded”) and the rest were recorded in mid-February at UCSD. The A side starts with the opener “Invocation Umea” which does exactly what the title suggests, setting the stage for the rest of the album, developing a few ideas to their extreme over the course of its eleven and a half minutes, showing the listener that the path ahead won’t be easy but will be highly satisfying. “For Glen Moore” is as beautiful a tribute as you’d expect for the bassist mostly known for his playing with the group Oregon. The melodic content is strong and unexpected, warping around the fingerboard, twisting in unusual ways, fluttering like a leaf on the wind. “Threaded” closes out the A side with an intense exploration of bowed bass. The B side of the record starts with “Hobby Lobby Horse,” a deeply political track that first appeared on last year’s Sedimental You album (which featured one of the best septets ever recorded). The tune itself is relatively straight forward, but this new version is anything but. Dresser covers nearly the whole range of the bass in a wide variety of ways, and the absurd political content is perhaps even more apparent in this solo iteration. The rest of the B side is comprised of a three track suite: “Modicana Teatro Greco,” “Modicana Shakeratu Non Zuccheratu,” and “Modicana Panettiere.” “Teatro Greco” features Dresser’s beautiful arco playing. “Shakeratu” features pizzicato, digging deep into the bi-tones Dresser has been exploring for decades, plus the briefest of prepared arco work that almost sounds like electronics. “Panettiere” close out the suite with moments of intensely quiet and distorted beauty . An impressive album, recommended to all fans of adventurous music. I saw Dresser perform solo a couple years ago in a small gallery where I was only a few feet away from him. It was a deeply moving performance and I have no doubt about the quality of the reviewed recording.